So we're not at the part of the series where the usual "format" to things has changed as the Baudelaire orphans are no longer assigned to a guardian of some sort at the start of the story. Now they're really on their own and doing their best to avoid falling victim to Count Olaf's latest scheme to get their fortune. The Hostile Hospital is an odd transition in the series as this time around we more or less have to start right in the action as the orphans don't start the story in the relative safety of Mr. Poe. Now it's not clear if he's still willing to help them as everyone is convinced that they're criminals (or at least orphans with very similar names who are guilty of murdering Count Omar as based on the news reports. But we're also at a point when we really start to see the orphans grow as they struggle to cope with all the dangers in their lives. They have to find a way to surviev on their own and the deck does seem to be stacked against them. 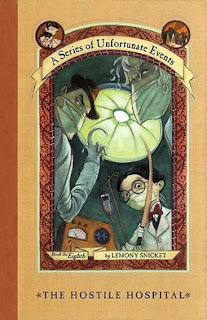 Synopsis: The Hostile Hospital is the eighth book in Lemony Snicket's A Series of Unfortunate Events. It is one of the books that was adapted to be part of the second season of the Netflix series. On the run from the law, the Baudelaire orphans end up traveling with the Volunteers Fighting Disease as they travel to Heimlich Hospital. They have no idea who the Baudelaires are as they don't believe in following the news and have made it their mission to try to help sick people get well by singing songs for them. The hospital ends up being a good destination for the Baudelaires as it is also the home of a very extensive Library of Records which may have more information about VFD and their parents. Upon arriving they end up volunteering to help out Hal, the elderly records keeper who has bad eyesight. He instructs them in the tasks needed to manage the Library of Records while the Baudelaires try to think of a way to get some time alone in the room to conduct their investigation. But of course things turn awry once Count Olaf and his crew arrive. They pose as a group of doctors and quickly take control of the administration office in order to have free reign over the hospital. What I Liked: This was definitely a rather dark chapter in the series and it feels like the Baudelaires really don't have much to bank on once Count Olaf has control of the hospital. He has his minions searching every floor for them, making things only a matter of time before they're caught. They have no shelter and end up needing to live at the hospital itself and survive on Hal's snack bowl and that's not much to work with. But this just sets the scene for an even greater triumph for them that proves just how amazing they are. I think Klaus really shined in this book, and it's not just because Violet is unable to take a more active role in things in the middle of the book. As much as circumstances sort of put him on the spot and leave him with little choice in the matter, he does step up to the plate and come through for his siblings. And that's really what this series is about - proving the strength of these children and showing how you can be great even with so little. What Could Have Been Better: Again, this is another book that teases you with a few more defintions of what VFD might mean but nothing really pans out. The Library of Records is an exciting plot device and one that promises a lot of information but in the end we only get one tidbit. It was a good piece of information, don't get me wrong. But after being teased across a few books already, it's frustrating not to get more by now. I sort of wish the henchmen had more to do in these books. We at least had time with them in the operating theater scene but really for the most part they're so much background noise. And this isn't even about not knowing their names. We clearly know who they are as characters and we "recognize" them every time they appear in a scene in their crazy disguises but in the long run they don't really do much but operate in the background. TL;DR: The Hostile Hospital is a bit of a stopping point in the series as things shift around and the direction of the story really changes. We don't learn all that more about the larger meta-plot, but we do end the book with a bit of a direction to pursue at least. And thus the book gets 4 sinister henchmen searching the hospital out of a possible 5.